M&Ms® chocolate candies have two possible origins. Some sources say that M&Ms® were invented in the 1930s, based on a suggestion by soldiers fighting in the Spanish Civil War. The soldiers protected chocolate candy from melting in their pockets and packs by covering the candy with a sugary coating. The M&Mf®/Mars Company adapted this coating to create its most popular product. M&M®/Mars, the company that currently manufactures M&Ms®, first manufactured the candies in 1940. Forrest Mars, Sr., who formed M&M Limited in Newark, New Jersey, wanted to sell chocolates that could be sold year round, especially during the summer months when sales traditionally decreased. Since air conditioning was not available, retailers did not have the means to keep chocolate from melting and consumers did not buy it. By putting his chocolate inside the candy shell, the chocolate did not melt and M&Ms3 could be sold any time. They could be eaten neatly in almost any climate. In fact, they were made part of service rations during World War II. At the heart of every M & M® candy is its chocolate, and chocolate has a long history. The cocoa tree is a native plant of South America's river valleys. It was brought north to Mexico by the seventh century A.D. The Mayans and Aztecs made a drink from the beans of the cocoa tree. The upper classes drank this concoction, called cacahuatl, which was a blend of the cocoa beans, red pepper, vanilla, and water. In 1528, the drink was brought back to Europe by Spanish explorers returning from the New World. They found the drink, as drunk by the natives, bitter and unpalatable, and they blended the cocoa beans with other ingredients including sugar, cinnamon cloves, anise, almonds, hazelnuts, vanilla, orange-flower water, and musk. They ground their new concoction and heated it to create a paste. The paste was smoothed onto the leaves of a plantain tree and allowed to hardened. The slab of chocolate was then removed. To make chocalatal, the ancestor of our hot chocolate, the Spanish dissolved a bit of the chocolate slab in hot water and thin corn broth. It was stirred to distribute the fats from the chocolate paste more evenly. By the mid-seventeenth century, choclatal had replaced cachuatl in its original areas for all except the lower classes of Mexico. The Spanish were also the first to consume chocolate in its solid form, though it was nothing like the center of a M&M®. After conquering the unfounded and widespread fear that the consumption of chocolate would lead to bowel obstructions, Europeans were able to enjoy the treat, and cookbooks including chocolate candy recipes sprang up. As made in the mid 1700s, the chocolate candy was a combination of the chocolate paste described above and sugar held together by plant gums. The candy had a coarse, crumbly texture that did not hold the sugar well, and it was not popular. that squeezed most of the butter out of cocoa beans. This process separated cocoa powder from cocoa butter. The powder was more useful on its own, providing a better base for hot chocolate. When cocoa butter was blended with regular ground cocoa beans, the resulting paste was smoother and easier to blend with sugar. Within 20 years, an English company introduced the first commercially successful prepared hard chocolate. 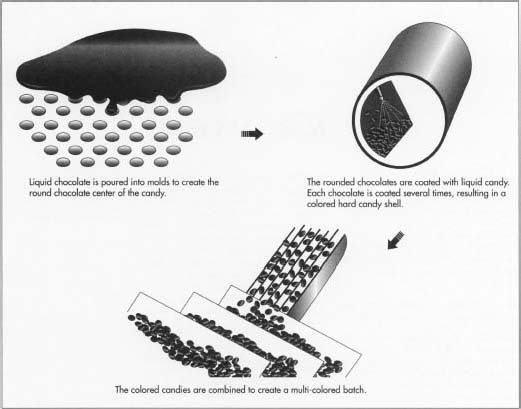 In 1876, Swiss candymaker Daniel Peter used dried milk to make solid milk chocolate. In 1913, another Swiss candymaker, Jules Sechaud, developed a technique for making chocolate shells filled with other confections. Chocolate was indeed publicly popular by this time, though still expensive. Hershey Foods marketed one of the first chocolate bars that was both widely affordable and available. Milton Hershey, the company's founder, became fascinated by a chocolate statue displayed at the 1893 World's Exposition in Chicago, Illinois. When he decided to manufacture chocolate, he used fresh milk and mass production techniques. The latter insured he could sell large quantities of individually wrapped chocolate at inexpensive prices. Hershey began to manufacture chocolate bars in 1904. M&Ms@, 1990. The M&M®/Mars Company claims that combined sales of all the M&M' varieties makes it the best-selling snack brand in the United States. M&Ms' have two main components, hardened liquid chocolate and the hard candy shell. Liquid chocolate comes from a blend of whole milk, cocoa butter, sugar, and chocolate liquor, among other ingredients. The chocolate liquor is a thick syrup that is made from the grinding of cocoa beans. Roasted cocoa nibs (nibs are the meat of the bean) undergo the process of broyage, in which they are crushed by a grinder made of revolving granite blocks. Chocolate liquor is actually composed of small particles of roasted nibs suspended in oil. The candy shell is made from a blend of sugar and corn syrup. 2 After the candies are formed, they are "tumbled" to make the chocolate center smooth and rounded. Then they are allowed to harden. 3 When the chocolates are hard, they are transported via conveyor belt to the coating area, where the process called panning is performed. 4 During panning, the chocolates are rotated in large containers as liquid candy made of sugar and corn syrup is sprayed onto them. The coats are sprayed on rotating chocolates at timed intervals. These intervals allow each coat to dry. Each coat leaves an even layer, a shell, of dry candy substance. The chocolate centers receive several coatings to ensure a uniform, complete coat on every piece. 5 The color is added to a finishing syrup and applied as the final coat. Each batch is a different color. Finally, the liquid candy dries into the hardened shell. 6 The single-colored batches are combined into the mixtures of red, yellow, blue, green, brown, and orange. They are then transported to the machine that stamps the "m" on the shells. A special conveyor belt carries the pieces to this machine. Each piece rests in its own indentation. 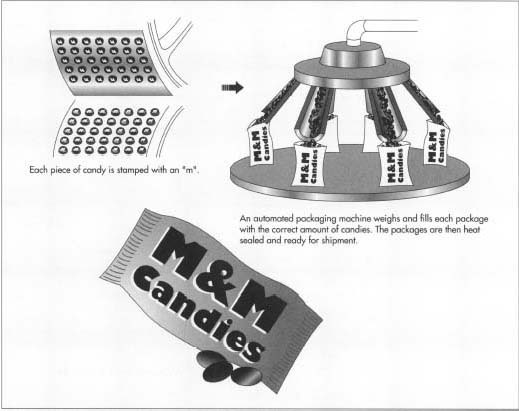 The piece runs under rubber etch rollers that gently touch each candy to print the "m." This machine is specially designed to imprint the "m" without cracking the thin candy shell. The process used is similar to the off-set printing process. Approximately 2.6 million M&Ms' are transported to the etching machine per hour. One hundred million individual M&Ms® can be manufactured per day. 7 A special packaging machine weighs the candies, pours the proper amount into individual bags, and heat-seals the package. Plain M&Ms' are proportioned (approximately) as follows: 30% brown; 20% yellow; 20% red; 10% green; 10% orange; 10% blue. Peanut M&Ms' are 20% brown; 20% yellow; 20% red; 20% blue; 10% green; and 10% orange. Peanut Butter Chocolate M&Ms® and Almond M&Ms® have even proportions (20% each) of yellow, red, green, blue, and brown. 8 The finished packages are moved along a conveyor belt to a machine that assembles the shipping cartons and fills them with the appropriate number of candy packages. The machine also seals the cartons shut. After the single color M&M® batches are combined, the pieces are sifted to eliminated any misshapen pieces. If an M&M' is missing an imprinted "m," it is not considered a reject. Because of the minor variations in shape from piece to piece, it is impossible to guarantee an "m" on each piece of candy. Hirsch, Sylvia Balser and Morton Gill Clark. A Salute to Chocolate. Hawthorn Books, 1968. The Story of Chocolate. Chocolate Manufacturers' Association of the U.S.A.
Cavendish, Richard. "The Sweet Smell of Success." History Today, July, 1990, pp. 2-3. Galvin, Ruth Mehrtens. "Sybaritic to Some, Sinful to Others, but How Sweet it is!" Smithsonian, February 1986, pp. 54-64. Marshall, Lydia and Ethel Weinberg. "A Fine Romance." Cosmopolitan, February 1989, pp. 52-54. "M&Ms® Factory Tour." 1997. http:\www.m-ms.com/tour/index.html (July 9, 1997). What did consumers say about m&m's when they were first made? What are they saying about m&m's now? Was there always just an m on the m&m's? I thought at one time they printed m&m logo on them? Im i just imagining things? My friends and I had a huge discustion on it and was just wondering if it was always just one m.
Where are M & M candies manufactured? Are they manufactured in China? How does the Packaging machine know how to sort the M & M's by color? Does it have a scale that weighs the batches? Um i came looking for Where did they get the idea!? Have you ever thought about making pistachio m&m's? Just curious, my friends and I are debating. So does an M&M candy have 1 later or 2 layers? Would you count the shell as a layer and the chocolate as another? Is the white, innermost coating, right on the chocolate surface, simply un-colored sugar or something else?